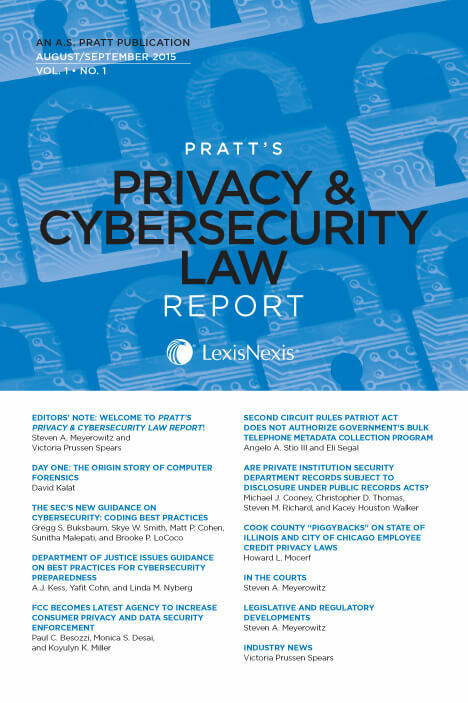 Pratt’s Privacy & Cybersecurity Law Report, written by the nation’s leading privacy and cybersecurity attorneys and professionals, is a subscription journal, published nine times per year, that explores and analyzes current developments in privacy and cybersecurity law, including statutory and regulatory developments, case law, data breach prevention and response, dispute resolution, and industry developments. Steven Meyerowitz has served as Editor-in-Chief and Victoria Prussen Spears has served as Editor of this publication since its inception in 2015. For further information or to become a subscriber, please click here. 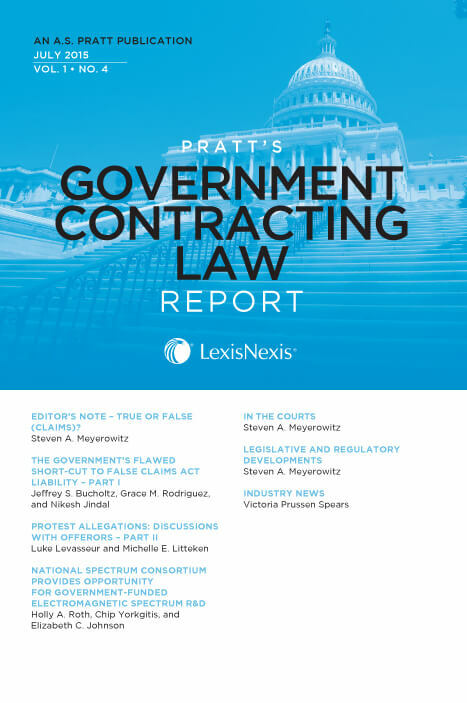 Pratt’s Government Contracting Law Report, written by the nation’s leading government contracting attorneys and professionals, is a monthly subscription journal focused on statutory and regulatory developments, case law, dispute resolution, and industry developments relating to federal government contracting law. Steven Meyerowitz has served as Editor-in-Chief and Victoria Prussen Spears has served as Editor of this publication since its inception in 2014. 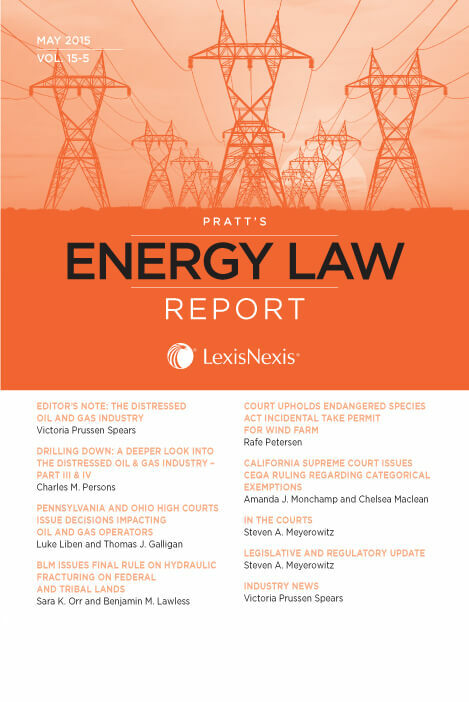 Pratt's Energy Law Report, written by the nation’s leading energy and environmental attorneys and professionals, is a monthly subscription journal focused on alternative and traditional energy law issues, as well as the critical juncture where energy technologies and the environment intersect. Steven Meyerowitz has served as Editor-in-Chief and Victoria Prussen Spears has served as Editor of this publication since its inception in 2014. 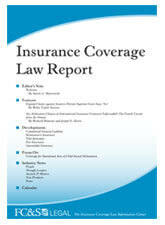 The Insurance Coverage Law Report is an authoritative source for analysis of insurance coverage law developments, court decisions, and statutory and regulatory changes affecting all varieties of insurance policies (including in the property/casualty, life/health and other insurance markets). Steven Meyerowitz has served as Editor-in-Chief of this publication since its inception in 2012. Victoria Prussen Spears, the Associate Director of FC&S Legal: The Insurance Coverage Law Information Center, contributes timely industry news, information on conferences, and publications. 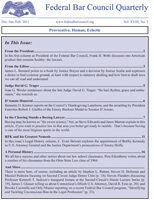 For further information or to become a subscriber, please visit www.fcandslegal.com. Pratt's Journal of Bankruptcy Law keeps its subscribers up to date with all the recent changes in bankruptcy, restructuring and debt collection issues. Steven Meyerowitz has served as Editor-in-Chief of this publication since 2005. For further information or to become a subscriber, please visit http://www.lexisnexis.com/store/catalog/booktemplate/productdetail.jsp?pageName=relatedProducts&skuId=sku-us-L64&catId=cat7160005&prodId=prod-us-L64. In the Employee Relations Law Journal practicing professionals provide clear and authoritative articles on key issues such as the Americans with Disabilities Act, family medical leave, sexual harassment, terminations and RIFs, age discrimination, alternative dispute resolution, key NLRB decisions, controlling benefits costs, and trends in employment law. Steven Meyerowitz has served as Editor-in-Chief of the Employee Relations Law Journal since 2003. For further information or to become a subscriber, please visit http://www.aspenpublishers.com/product.asp?catalog_name=Aspen&product_id=SS00136808. The Banking Law Journal covers every area of major interest to bankers and attorneys, with practical material for bank counsel use, articles of current importance by recognized experts, plus digests of important cases from every jurisdiction. Steven Meyerowitz has served as Editor-in-Chief of The Banking Law Journal since 2000. For further information or to become a subscriber, please visit http://www.lexisnexis.com/store/catalog/booktemplate/productdetail.jsp?pageName=relatedProducts&skuId=sku-us-819&catId=cat7160005&prodId=prod-us-819. The Intellectual Property & Technology Law Journal is a focused, highly practical publication that analyzes important trends in patent, trade secret, trademark, and intellectual property law. Steven Meyerowitz has served as Consulting Editor for Submissions of this publication since 2000. For further information or to become a subscriber, please visit http://www.aspenpublishers.com/product.asp?catalog_name=Aspen &product_id=SS10413952. The Real Estate Finance Journal examines the opportunities and pitfalls facing real estate owners, developers, investors and lenders and focuses on financing, liability, investments, taxes, and asset management. Steven Meyerowitz has served as Consultant to the Editor-in-Chief of this publication since 2000. For further information or to become a subscriber, please visit http://west.thomson.com/productdetail/4165/14938747/productdetail.aspx. Federal Bar Council Quarterly contains useful information on newly appointed judges and practice and procedure developments, as well as news and commentary. Steven Meyerowitz has been Managing Editor of the Federal Bar Council News/ Federal Bar Council Quarterly since it was founded in 1994. For further information or to become a member, please visit www.federalbarcouncil.org.